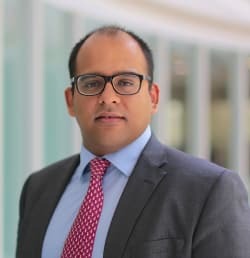 Naval Satarawala Chopra is a partner in the firm’s competition law practice, focusing on both contentious and non-contentious competition law matters. He is recognised as a leading practitioner of competition law and his clients include both private and government enterprises, including Microsoft, Facebook, Uber, National Stock Exchange, Monsanto Company and VeriFone. Naval also worked closely with the Ministry of Corporate Affairs and the Competition Commission of India in the finalisation of the Indian merger control regime. Naval was inducted by Global Competition Review in its list of top "40 under 40" competition lawyers worldwide. He is acknowledged by Chambers and Partners 2015 as a “master strategist” who is known for his 'very sound handle on Indian law' and his “ability to think out-of-the-box and find solutions by balancing the law and commercial considerations”. He has also been recognised as a Who's Who Legal: Competition Thought Leader for the past two years, and has been described as leading difficult matters with “high-level advice, business thinking and excellent contacts”. In 2014, Naval instituted a course on competition law at ILS Law College, Pune, where he teaches part time. He is qualified to practise in New York, England and Wales, and India. He holds an LLB from ILS Law College, Pune and an LLM from the University of Michigan, Ann Arbor. Prior to joining the firm, Naval was an associate in the India Group at Freshfields Bruckhaus Deringer, London for almost five years.